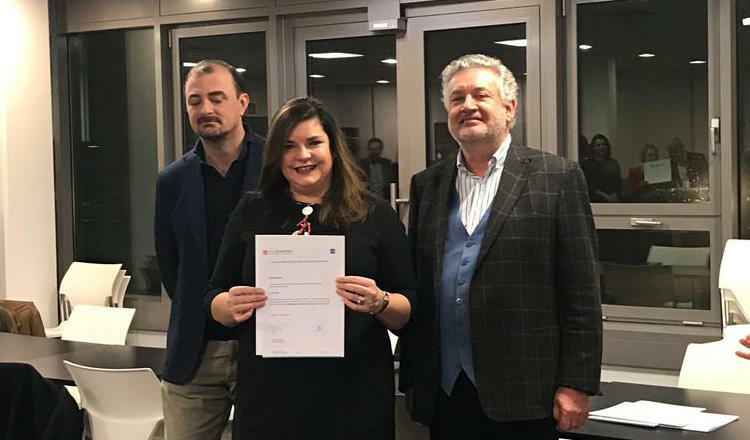 This week Cecilia Spoor, our Leadership Programme Director here at AAE, was awarded her Executive Masters in International Association Management from the Solvay Brussels School of Economics and Management. "I really gained insight into all aspects of International Association Management. The course and the academic teaching staff were all excellent. Learning from the guest speakers was incredibly helpful, and input from fellow students was rewarding." Cecilia Spoor with Alessandro Cortese (L), Executive Master Co-Academic Director and CEO of European Society for Radiotherapy and Oncology (ESTRO) and Philippe Biltiau, Academic Director of the Solvay Brussels School of Economics and Management.